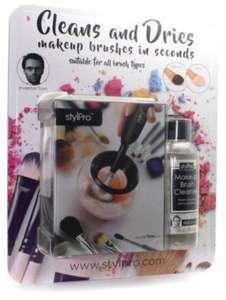 The latest invention from Tom Pellereau (winner of The Apprentice and inventor of the curved nail file), StylPro leaves makeup brushes clean, dry and ready to reuse in seconds. Professionals recommend cleaning makeup brushes every two to four weeks, but traditional cleaning methods are messy, laborious and leave brushes wet and unusable for up to 24 hours. StylPro uses an innovative centrifugal spin technology to leave your makeup brush completely clean and dry in less time than it takes to choose a shade of lipstick! Make up brush cleanser also avaliable here. Works best with anti-bacterial soap and water for non oil-based makeup or StylPro Makeup Brush Cleanser for oil-based makeup. Suitable for most makeup brush types (synthetic and natural) including: lip liner, eye liner, eye shadow, concealer, primer, foundation, contouring, highlighting, kabuki, buffing, blending, fan, blusher, bronzing and powder brushes. StylPro has been creating a real stir in the beauty industry and has been featured by many beauty pages including Daily Mail, Metro, Hello! OK!, Cosmopolitan, Professional Beauty, Pure Beauty, Beauty Magazine and Warpaint and reviewed online by leading beauty bloggers and makeup artists including Wayne Goss and Kenneth Soh. I saw this in Costco too, hopefully I works!